Michele Attias was born in the Rock of Gibraltar. 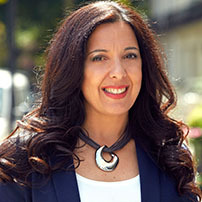 Her career covers over 20 years in Personal Development. She started as a Psychotherapist and further on transitioned into Coaching, Public Speaking and Writing. She’s a Writer for Inbound, Lifehack, Divorced Moms, Women in Business and Personal Growth. Last year she was nominated and shortlisted for The Women Inspiring Women Awards in the UK. Michele re-invented her life 4 years ago and has a particular speciality in this subject where she speaks passionately about dealing with uncertainty, change and the global misunderstanding that joy is a place to get to, a relationship, or a material possession. As a speaker, she focuses on the listener being able to extract from her talk their own personal ‘take away’ that will be useful and impact their life moving forward.